A quick daily cleaning of your ring with just warm water and a soft toothbrush can keep your ring sparkling for day to day wear and help reduce the need for longer soaks. When not wearing your ring, it's best to make sure that it's protected from anything that could cause damage. We recommend storing your ring in a ring box or the ring slot of a jewelry box, making sure it's not jumbled around with other pieces of jewelry that could scratch the precious metal or knock stones loose. When traveling, a travel case or pouch will help protect the ring if you no longer have the original ring box. Be conscious of the fact that engagement rings are not indestructible! Even though diamonds are the hardest substance on Earth, the precious metals that form the majority of your ring, are not. Metals can bend or break under pressure, so be aware of how you use your hands while wearing your ring. Consider removing it for any times that there will be large amounts of pressure on your hands or your hands will be submerged or covered in any type of product that may affect the appearance of the ring. Read more about when not to wear your engagement ring. Rings should have regular maintenance (same as a car!) 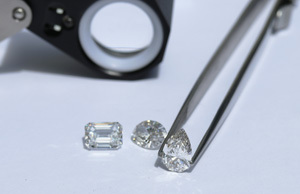 to check for loose stones, worn prongs, or other repair issues. A yearly inspections by a jeweler, along with a general polish and refurb, can keep rings in the best condition for long term wear. Over time rings can develop build up around and under the stones from lotion, cosmetics, cleaning products, and any other products that get on your hands! To give your ring a deep clean, use mild soap (dish soap works well as it helps break up any greasy deposits that can make diamonds appear cloudy or dull) mixed with warm water and a soft toothbrush. Soak your ring for 10-20 minutes, as needed, and then scrub gently with the toothbrush under warm running water. Be sure to get underneath the diamond, as build ups can form here in particular. We always recommend insuring your engagement ring to protect against the unforeseen. Jewelry specific insurance can protect you in the case of ring loss, diamond loss, theft, damage, etc. While jewelry insurance can sometimes be done as a rider to a homeowner’s insurance policy, they are often not well developed for jewelry claims other than loss/theft, and a jewelry-specific insurance (we suggest Jeweler’s Mutual) can provide more complete coverage for any potential issues. If you’re wondering which ring style is the best choice for you, read How to Choose the Right Engagement Ring for Your Lifestyle. With proper care and storage, you’ll be able to enjoy your Ada Diamonds engagement ring in its original brilliant condition with ease.